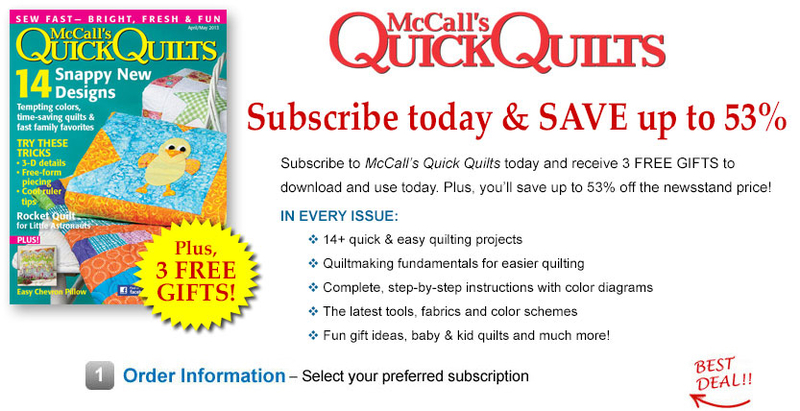 McCall's Quick Quilts - Subscribe Today! Password must be at least 8 characters long. Your e-mail address and password will be used to access your digital subscription on any computer, tablet or smartphone. Get instant access to current issue! *Pricing in U.S. dollars. Includes shipping & handling costs for print issues. Bill Me Later option for U.S. orders only. McCall's Quick Quilts publishes 6 times a year. Savings based on an annual newsstand price of $29.94. Sales tax may apply. 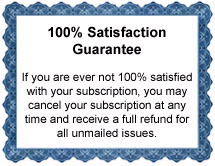 Print Subscriptions will receive their first issue in 6 to 8 weeks. Digital and Premium Subscriptions will receive instant access to the current digital issue upon order.